Lilies, lilacs and peach colored roses set the tone for this splendid Ketuba. 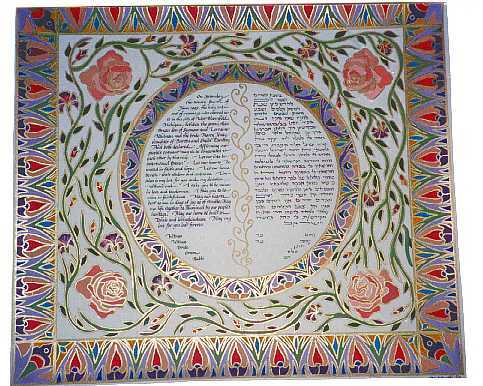 The text is surounded by a wedding ring and enhanced by a growing vine, seperating the Aramaic version from its English translation. The overall effect is to envoke a sense of joyous spring day. Life renewing itself and blessing the bride and groom that they should have the same happiness in their new life.